This Browned Coconut Butter is smooth, creamy and rich in flavour. Only ONE ingredients needed to make this incredible nutty spread that you can use to bake, spread or eat by the spoonful! We all know how delicious coconut butter is. It’s creamy and luscious, but you guys theres something even BETTER than coconut butter. I’m talking browned coconut butter. The best part about this magical sauce is that you only need one ingredient: shredded coconut. OR you can use store bought coconut butter, which ever you like. My inspiration for Browned Coconut Butter were these cookies I saw at my local bakery. They were these brown butter walnut chip cookies and unfortunately they were not vegan. But we all know, we can make pretty darn delicious vegan baked goods using coconut butter, so I thought why not browned coconut butter? I would be lying if I said it was a quick recipe to make. It does take a bit of time to brown the coconut butter (but still really only 15 minutes), but it is SO worth it. The end result is this toasty, nutty, rich and creamy spread that has a incredible flavour of its own. Expect to see some recipes using this magical ingredient! I’m thinking of trying to recreate those browned butter walnut chip cookies! and it’s just such a magical condiment you don’t want to be missing out on! 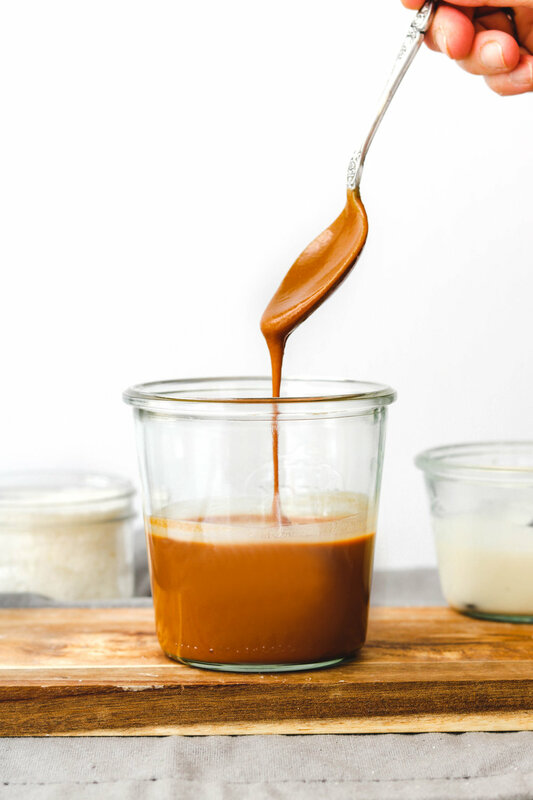 If you make this Browned Coconut Butter please share it and let me know what you think by tagging me on Instagram @lisakitahara, I love seeing all of your tasty recreations! Add the shredded coconut flakes into a blender and blend until a smooth butter forms. You may need to scrape down the sides a couple of times to help it blend. Once it becomes quite smooth and liquidy, transfer the coconut butter into a non-stick pan or a small shallow pot. Turn the heat up to a medium high. Once the coconut butter starts to heat up give it a good mix. Then, turn the heat down to a medium low and continue to stir quickly every time it begins to bubble. This helps brown the bottom layer without burning. Continue for around 12-15 minutes or until the coconut butter becomes a light brown colour. Transfer to a air tight jar and store at room temperature. Bake with it, top all your food with it, or eat it stright out of the jar! I highly recommend using a high speed blender for this. The one I LOVE and have used for years is the Vitamix. Other blenders tend to blend outwards which makes it difficult for the coconut butter to catch onto the blades. If you do not have a Vitamix or high speed blender, I recommend using a food processor. Minimilist Baker has a lot of tips on her blog post on how to make the perfect coconut butter with a food processor. If your kitchen is on the cooler side, the coconut butter may harden up. To use as a spread, simply put the jar in a bowl of hot water to help melt the coconut butter. I do not recommend microwaving it as I’ve had it burn multiple times.